Suitable for 100Base-T applications, 8P8C modular jacks support Gigabit Ethernet applications. 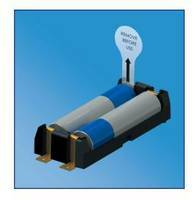 RJ45 sockets, rated for 125 Vac RMS and fully compliant with IEEE and IEC standards, endure 500 min insertion cycles. 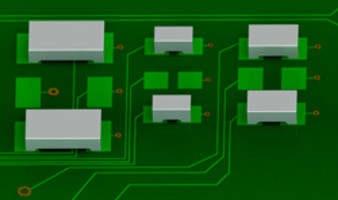 Horizontal (right-angle) PCB modular jacks come in Thru-Hole or SMT soldering configurations. 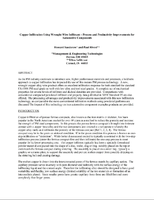 Styles are also available for low-profile, compact, and deep socket applications. Vertical (top-entry) options are also available, and panel mount modular jack has 2-piece locking design. 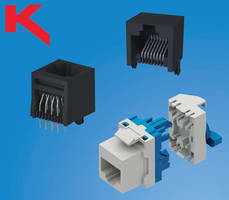 Astoria, NY — A new series of advanced 8P8C modular jacks suitable for 100Base-T (Fast Ethernet) applications to support the high-speed performance requirements of Gigabit Ethernet applications, are now available from Keystone Electronics Corp. 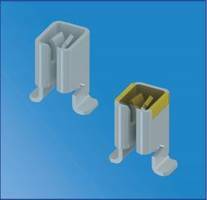 Manufactured for increased durability, the new Keystone RJ45 sockets can endure a minimum of 500 insertion cycles. Rated for 125 VAC RMS, these jacks are fully compliant with IEEE and IEC standards. A variety of styles are available to accommodate design applications with numerous mounting and port size options. 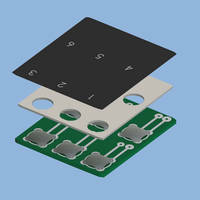 Horizontal (Right-angle) PCB modular jacks are available in Thru-Hole or Surface Mount soldering configurations. For Low Profile applications, request Cat. No. 943. For Compact designs, Cat. No. 942 is recommended. Applications that require a deeper socket can be met by using Cat. No. 948. 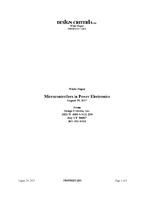 Designs for surface mount installation can utilize Cat. No. 944. 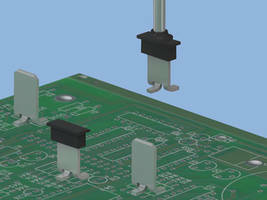 For devices where connectivity will be perpendicular-to-the-board, a Vertical (Top-entry) PCB modular jack, Cat. No 949 is offered. As part of this new series, Keystone is offering a Panel Mount modular jack, Cat. 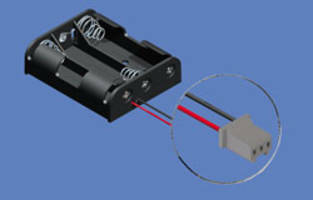 No 946 which is supplied in a 2-piece locking design to simplify and secure wiring of the jack. Keystone Electronics Corp. is a major manufacturer of interconnect components and hardware and provides a full complement of stamping, machining and assembly services. An in-house application engineering group is on hand to aid in product modifications or customers special designs. Keystone is an ISO-9001:2008 certified company, RoHS compliant with headquarters in the US and offices in Canada, Europe, Australia and Asia. For more information, contact Keystone Electronics Corp., 31-07 20th Road, Astoria, NY 11105-2017; Tel. 800-221-5510; Fax 718-956-9040; E-mail: kec@keyelco.com or the company website www.keyelco.com.